The table of the diamond is one of the facets that make up the crown and is the most important facet to be considered when evaluating the cut of the diamond. 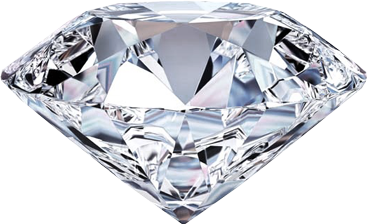 It is the main point at which light enters the diamond before going on to reflect and refract all around it. It is also the facet that lets out the most fire and sparkle. Though the table is usually the largest facet of any diamond, the proportion of its size varies, depending on the particular shape or style in which the diamond has been cut. In a Round Brilliant cut diamond, the ideal percentage of the table’s size in relation to the width of the girdle is 56% while in the Mirror cut, this percentage can soar dramatically, up to 90%. The size of the table determines, to a large extent, the overall brilliance of the diamond: a smaller table area will result in increased fire but reduced brilliance while a bigger one will increase brilliance and reduce fire. The usual practice is to find the optimum proportion that maximizes both features. In most cuts, the table is cut in such shapes as round and oblong.